The Park spans over an area of 820sq. Km which includes Rajaji, Motichur and Chilla wildlife sanctuaries, parts of Dehradun, Shiwalik and Lansdowne Forest Divisions. 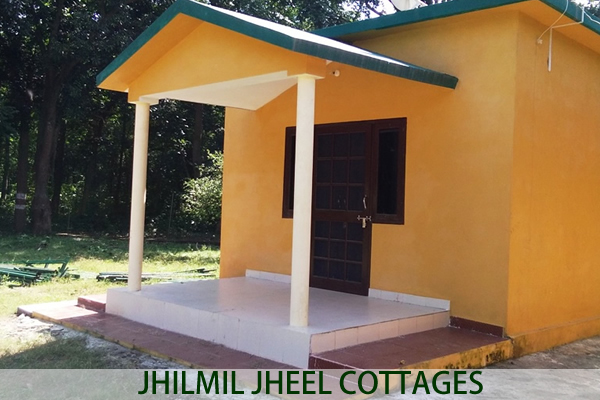 These three sanctuaries were amalgamated in 1983 to Rajaji National Park, named after the Late Raj Gopalachari The last Governor General of India in British period. The Holy river Ganges flows through the National Park for a distance of 24km, . 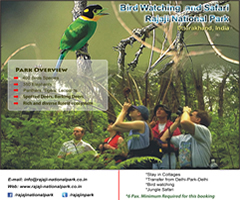 Rajaji National Park of India is nestled between the Shivalik ranges and the Indo-Gangetic plains. Broadleaved deciduous forests, riverine vegetation, scrubland, grasslands and pine forests form the range of flora at these parks. The dense jungles here are home to vivacious wildlife here. 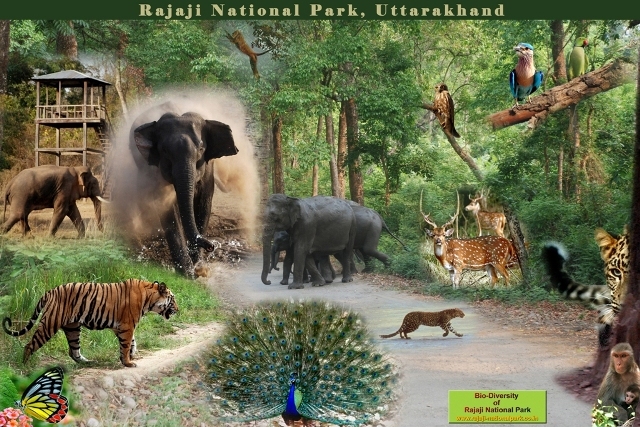 To reach the Rajaji National Park from most part of the country is quite easy. It is only 265 km from the Delhi through the NH-58 and there are convenient overnight trains from Delhi to Haridwar and Dehradun, from where the visitor can visit the park. Visitors can also fly to Jolly Grant Airport, which is located at a distance of about 30 km from Motichur gate of the Park. 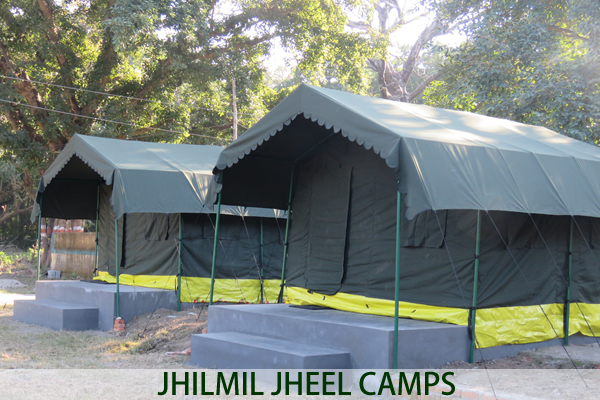 There are not too many options available for comfortable stay in Rajaji National Park. 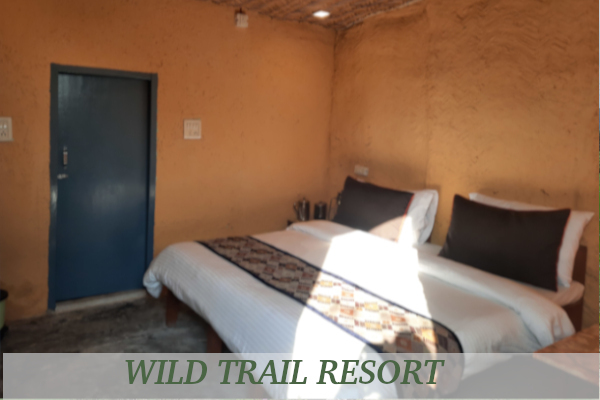 Comfortable Eco-friendly cottages in wilderness are available at Wild Brook Retreat near Gohari range of Rajaji National Park, 24 Km. from Haridwar. 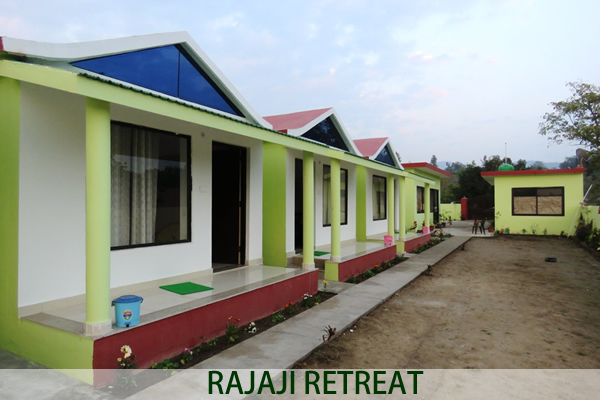 The Palm Resort, Satyanarayan FRH are also approachiable from Haridwar-Rishikesh road with all basic facilities at the centers. 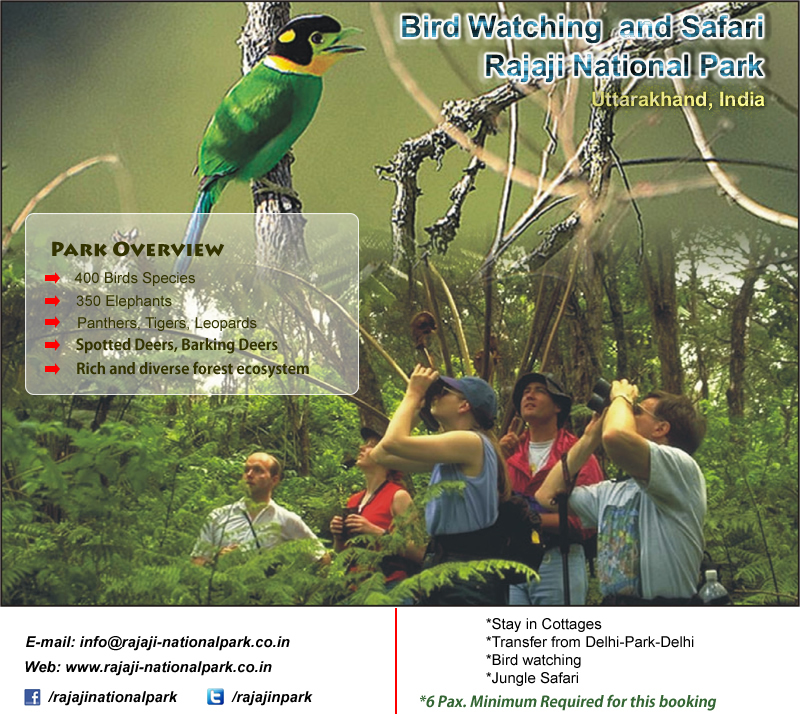 Over 300 species of birds are reported from Rajaji National Park, making it an important birding area in the Country. Of these, about 90 species are migrants, which include Pochards, Gulls, Mallards, Teals and Shellducks that visit the water bodies of Bhimgora and Virbhadra Barrage and wetlands of river Ganga. The resident Birds include Pea Fowl, Jungle Fowl, different Parakeets, Woodpeckers, Kingfishers, Thrushes, Warblers, Barbets and Finches etc. Great Pied Hornbill occupies a place of pride among the different Hornbills found in the Park. 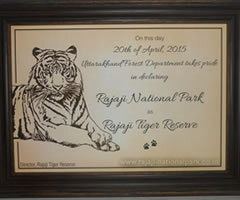 Rajaji National Park is situated in the foothills of the Shivalik Range of Himalayas. Most of the land is covered by Sal forests. At Chilla and Motichur Gate one can go on Bird Watching Safari. One and Two full days birding package available.